As I sit here at 2:17 a.m., I know that I should go to bed, but after the day’s event, I felt this incredible urge to briefly write about what happened today while at a friend’s pool party. I know this has nothing to do with home decor, but that’s not important right now. What’s important is that my beautiful 7-year-old almost drowned today. Miraculously, he didn’t even take in water. Even more miraculous is that he wasn’t shaken up enough to prevent him from going back into the water (albeit with a very tight life vest!). He ended the day with a smile and begging for a bag of Doritos as we drove away warm and dry, towards home. Although I wasn’t too shaken up during the near-tragedy, as the day has worn on, I’m even more consumed with fear at what almost happened. I was so vigilant to make sure that not one of my 3 boys (ages 7, 3, or 21 months) went near the water until Mommy was right next to them. I was sitting there on the edge of the pool with my 21 month old in my lap, and my 3 year old on my right. I didn’t see my 7-year old slip off to the other side of the pool, which, honestly, wasn’t very deep. Just over 4 feet, maybe?? But as we all know, it doesn’t take a lot of water, does it? My friend’s daughter and I started chatting about her coming home from college. And after 30 seconds of conversation or less, I just happened to glance up at the other end, and I saw him struggling in the water, right next to the wall. I actually sat there for a second, thinking he was about to grab the wall. But all I saw were arms flailing and his head bobbing under water. The first thing that flashed through my mind was an article circulating last year about the 8 Quiet Signs of Someone Drowning, that said you never know when someone is drowning because it’s so quiet and very quick. And my friend’s 19 year old daughter jumped in and saved him. All the things I would have thought would happen (my heart beating fast with an adrenaline boost, shaking from fear, etc.) didn’t happen. I approached him calmly and said, “OoOooohh…..” and he actually thought I was laughing at him, I guess because I was too lax in my response as he was near tears. I placed my arm around him and assuaged any fears he might have had, then snuggled all my boys into life vests, and went on to have a great time in the pool with them. What was so ironic is that there were so many people standing around, talking, and some of them even in lounge chairs no more than 15 feet from the edge of the pool. Yet, no one but me noticed. I’m convinced it was divine intervention, at that moment, that I looked up. Maybe I subconsciously noticed he wasn’t nearby. As I sit here early in the morning, with my hubby and boys sleeping, I have Googled “quiet signs of drowning,” and am horrified to learn that drowning is the 2nd leading cause of death for children ages 1-14, just behind car accidents. They call is the “quiet death.” And, today I understand why. He made no noise. No one even knew. I’m soooo thankful my son is okay. But I keep playing the horrible “What if?” in my mind….What if I hadn’t looked over at that moment and he slipped below the water? How long would it have been before I noticed he was gone? Before even going to the pool party, I was super vigilant of the fact that we were walking into a danger zone, simply because my boys have never learned how to swim. Bad mommy, I know. But logistically, I have never been able to teach them (lack of pool, and supervision to teach them). So I knew to be more mindful of each of their whereabouts. And because hubby wasn’t there, I knew I was at a disadvantage being the only pair of eyes that could watch all 3 of them (which was very hard to do). But thank God, the day ended well. Tonight we carried on like it was a regular night (albeit the night before school starts), with me not trying to hype up the event and scare him. But I was even more acutely aware of his beautiful life as he triple hugged me before going to bed tonight. And all the while I kept thinking of what almost happened. So, I know that summer is just about over, but please, please, be extremely careful around water. 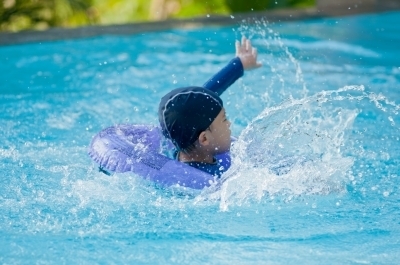 Here’s a few reminders when you’re around water with kids. Let my experience be a reminder just how serious this can be. 1. Never ever take your eyes off of kids. Not even for a second. It happened so quickly today. One second he was there. The next I saw him flailing his arms. I was distracted by the brief conversation. And in that moment, he slipped away. Never again. 2. Always put your kids in a life vest. Even if you don’t think the water is that high, do it. No matter what. 3. Do NOT talk or text. I live with my phone in hand. But this is one circumstance where you just cannot. 4. Watch other people’s children. I’m sure the last thing you want at a pool party is to keep an eye on other people’s children. But if we all just take special note of the children and where they are at all times, it might be easier to prevent accidents. 5. Don’t be outnumbered. I was there with 3 kids who didn’t know how to swim. I could call myself stupid. But that won’t get me anywhere, will it? If you’re at a pool with kids, always have help in looking at the kids. If hubby could have come and wasn’t working, two sets of eyes would have been better than one. 6. Get swim lessons. At this point, there’s no reason why kids shouldn’t know how to swim. It could probably one of the best things they’ll ever learn. I’m making appointments ASAP for lessons. Now I’m going to go kiss my baby goodnight. « 5 Bad Decorating Habits to Stop: How to Decorate For YOU! Kerry, I’m soooo sorry to hear that you had the same thing happen to you yesterday with your son!!!! So scary! I’m glad he’s okay! These poor kids….. You know, after that incident with my son last year, I enrolled him and his 2 brothers in swim classes (my son is now 8, his brother 4.5 and his youngest brother 2.5). A couple weeks ago, in swim class, the instructor took my 8 year old’s class down to the deep end, and they were about to jump off the diving board. My heart starting pounding so hard!!!!! My son has been doing okay in his swim classes, but he’s not able to go more than a few yards yet. Thankfully, the instructor was right there in the pool, waiting to help, but OMG, kids and water make me nervous. Anyhow, sorry to ramble! I’m so thankful your son is okay. And if he hasn’t already started, please get him involved in swim classes. Even though my son says he’s not really interested in going for more sessions, I told him that he has no choice until he has proven he can swim. WHEW…..
How ironic that I read your story and it so reminds me of mine. On Mothers Day in 2011 we were sitting w/ multiple family members at my sisters in laws pool. I had my 2 grandchildren w/ me, Peyton age 7 and Jeremy age 8. They were having fun playing in the pool and swimming w/ their older cousins, 1 of which was about 18 and a lifeguard at the local city pool. Long story short, Peyton came to me, we talked (about whatever), then she went to the pool, walked over the cross walk to the other side, came back around towards me, and then nothing. I must have caught this out of the corner of my eye, because I did not see her, scanning the pool I see her arms reaching upwards, her head and face under water. I was probably 20 feet away. I jump up, and the same as you Holler for the cousin to get her (she was less than 5 feet away and in the same area). But, she didn’t. I jumped in the pool, clothes and all and pick her up. Like you, I didn’t get mad, it was calm between us. Thank God, everything is OK now. She still loves to swim and play in the water. Just to let you know, I TOTALLY UNDERSTAND. I’ve been there. And don’t wish to be there again…. I am so glad he is okay. I too have several close calls drowning. I fell in the deep end of a pool when I was 8, not knowing how to swim. I realized if I stayed calm and kicked my feet I would move in the water. That is how I learned to swim. My mom probably felt a lot like you did (she screamed for people to get me too). The river experience was when I was much older but I learned that the river is a living entity and I had to fight to get out. The person with me was frozen and just stared at me while I struggled. When my brother was 7 I gave him a piggyback ride in the pool and he started to panic, he started choking me and I lost my footing. All I could think about was not drowning my brother. Someone jumped in a pulled him off me. All the blood vessels in my face were popped from getting choked. Anyway, I still swim but I follow the rules you outlined plus a few extra: No grabbing people or letting people grab onto you in the water, ever! No going out into a river(or ocean) unless you have master the strokes and understand how to get yourself out of an undertow/riptide. I remember seeing this video a few years ago!!! I agree, a powerful video for parents to see! !